Purple Martins Coming Home in Droves! For some reason the purple martins this year to be a lot more vocal than usual. In past years they seem to trickle in a few here and there and then they keep a low profile. Staying away feeding for much of the day. Not wanting to draw too much attention while their numbers are low. This year seems a bit different. Maybe its because our colony here in Loxahatchee, Florida is now firmly established as we enter our 6th year, or perhaps its just the size of the colony, now offering over 45 compartments. It just seems like the birds are hanging around, chortling, sitting in the entrances of their gourds staking their claim. They were a few days late this year but they seem to have arrived in greater numbers. I counted 15 in the air but I am sure there were some in the gourds. I have a few final finishing touches to complete to the colony site. Putting up 2″ x 4″ hardware cloth on the 2 aluminum martin houses on the MPP, is on the to-do list. Also changing out some access caps with the new Heavy Duty caps that won’t stretch and pop off. Also the BirdCam is being worked on and though it is proving to be a bit more troublesome this year, I am sure the live streaming cam will be up soon. The MPP is a Multi Purpose Pole that lets you hang 2 houses on 1 pole and plus hang gourds below. The picture shows not only the MPP pole at our colony but the same pole we sell at our site, BTW. I added even more gourds to this set-up by adding a set of Universal Gourd Hanging Arms to the houses themselves. So The pole has 12 house compartments and 8 gourds for the martins to choose from. Though you could in theory add more gourds, I usually don’t recommend going more than 18 compartments/gourds on any 1pole. Remember, the problem isn’t with the weight, per sea, but with the time it takes to check on so many compartments. Inevitably what happens is that you will end up not being able to check nests because of the variation in nest ages and then you have to worry about scaring babies that are close to fledge age. It can get a little tricky and if you don’t keep up on nest checks, you end up with a cluster! For those that want to offer houses and gourds and have limited backyard space, the MPP is a wonderful thing. 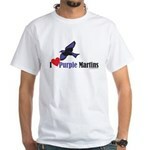 PURPLE MARTINS Have Arrived in Palm Beach County, FLA.
YEAH! It is official. The purple martin season has begun! I am happy to report the arrival of 2 ASY purple martin females. They are chortling and sticking heads in compartments and even entering a few gourds. They seem none the worse for wear and happy to be home. I will take photos and be posting them asap. Also I am in the midst of getting 4 new cams up and working. STAY TUNED!